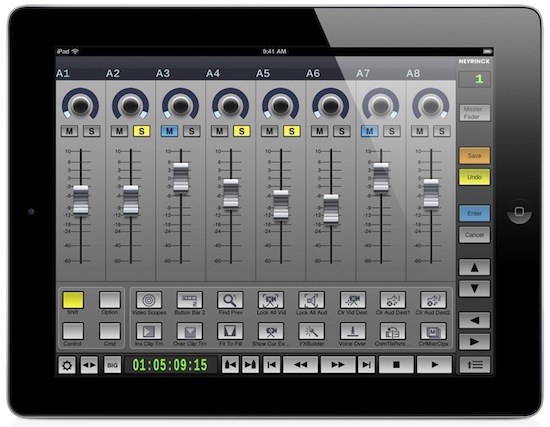 Neyrinck software’s latest version of the V-Control Pro iPad application, that provides wi-fi control of a host of media applications on Mac and PC including Pro Tools, Logic Pro 9, Cubase/Nuendo, FL Studio, Tracktion, Studio One, Reaper, Reason, Ableton Live, Final Cut Pro 7 and Sonar, now includes full support for Final Cut Pro 5, 6 and 7. For the first time it is now possible to get multi-touch-control of key features in Final Cut Pro from an iPad over a wi-fi network. The new Final Cut Pro iPad interface includes 8 bankable audio faders with pan, solo, and mute, and a full set of transport controls including jog and shuttle. One of the most useful features to help speed up the editing process are the 80 soft keys organized as five sets of 16 touch-screen function keys that can be programmed with any of the hundreds of FCP commands including favorite effects such as adding a color corrector to a clip. Each key can be custom labeled with text and the appropriate icon from the FCP commands list. V-Control Pro’s new and unique V-Window feature also lets users bring up any window in FCP, or any other application running on the Mac, to the iPad, opening up a whole new world of control possibilities from color correction to I/O control. Founder, Paul Neyrinck, received many requests from V-Control Pro users for the Final Cut Pro interface, “This is the first interface for V-Control we have designed for video editing and I am really pleased with initial response from users. Editing is a very time-intensive task and we focused on providing touch-controls that would really make life easier for the editor in a very visual and naturally responsive way”. V-Control Pro can control a host of media applications on Macs or PCs from the iPad and is available for $49.99 from the Apple App Store. Neyrinck’s YouTube channel features videos showing Final Cut Pro control and setup from the V-Control iPad application.